Dress: The Prisoners of St Petersburg, Bali. Shoes: Bali Markets. I found this small boutique called The Prisoners of St Petersburg (I have no idea where the name came from and cannot find a website) whilst walking through Seminyak when we were in Bali earlier this month and stopped in my tracks as soon as I saw this dress in the window. I was in love before I tried it on and had it on the counter ready to go without checking the price tag, so it was a tad more expensive then my usual dresses but worth the splurge. I absolutely love maxis but don’t usually go for them because I like dresses that show off my waist. The shirring at the back of the dress keeps it close to the body without being uncomfortable and ends far enough down to make the dress seamlessly flow into a full skirt. Also, the cut outs at the front give it a quirky different look to your usual maxi. I took hundreds of pictures on my trip to Bali and cannot wait to start posting but I have no idea where to start so I decided to go with this outfit post until I get sorted! You may have noticed after one short month I have already changed my blog design. Even though I paid a ridiculous amount of money for my last design and it being several months late, it was done with little effort and I was very disappointed with it. Instead of working through the problem the designer decided not to reply instead and I was left with something I hated. So after searching Etsy I found this pre-made template that I love so much more. P.S Congratulations to my Polaroid Camera Giveaway winner Manon from Coconut Fashion! Stay tuned followers because there are a lot more giveaways coming! Wow it's cut really beautifully! This print is so stunning! I'm key obsessed, so naturally it's love. Beautiful dress!! Thanks for the visit. Let me know if you would love to follow each other. Amazing dress Meg! you look great! Gorgeous dress! Lovely to see a really nice Australian blog! (I'm from Victoria). I'm your newest follower! I'm having a little product give away over on my blog if you are interested in having a look. Wow your dress is amazing ! this maxidress is super gorgeous!!! You look amazing dear! Love the outfit and the pics are Perfection! I love this maxi dress! you look absolutly fantastic!!! The key print is so unique and fun! Love the detail through the front and the cut out bits. Omg you look marvelous. Love the beautiful maxi dress! That is one awesome dress:) Love your new blog design too. Beautiful dress and perfect location, you look stunning! What a gorgeous dress and magnificent pictures!! Love the style of this and the print! I have never seen a dress like this before, it is super pretty!! Wow such a gorgeous dress, you're beautiul! I love the new blog's layout! You look great in that dress. Looking forward to your next posts. So beautiful pictures and you look perfect! Wow!! this is just amazing! and it fits you really well! love the cuts on the belly. It´s a shame there´s no an online shop. That dress is just incredible. I love that it is a slinky and sophisticated dress, but it has such a fun, bold print! You look lovely, love the photos too! I love how unique and fun the print is, you look super amazing. I love the dress, you look beautiful :) I love your blog and I have followed you with Bloglovin. if you ever get a chance to check out my blog I would be delighted, thanks! ps. would you maybe like to follow each other? Such a lovely dress! You look great wearing it. You look amazing in this dress, dear, I love print of it! Love the print on this dress. It's really cool. Here is my blog if you want to check it out. Such a stunning photograph. You're truly beautiful! Absolutely love this dress looks amazing on you! That dress is just exquisite on you - so obsessed!! This dress is so beautiful and unique. You have an amazing body for it! Wow super pretty dress, such a cute look! love the shape & pattern on this dress. what a lovely find! can't wait to see your photos from bali. That a funny name for a boutique ( and quite long, too) I wondwr what type of clothes they had! 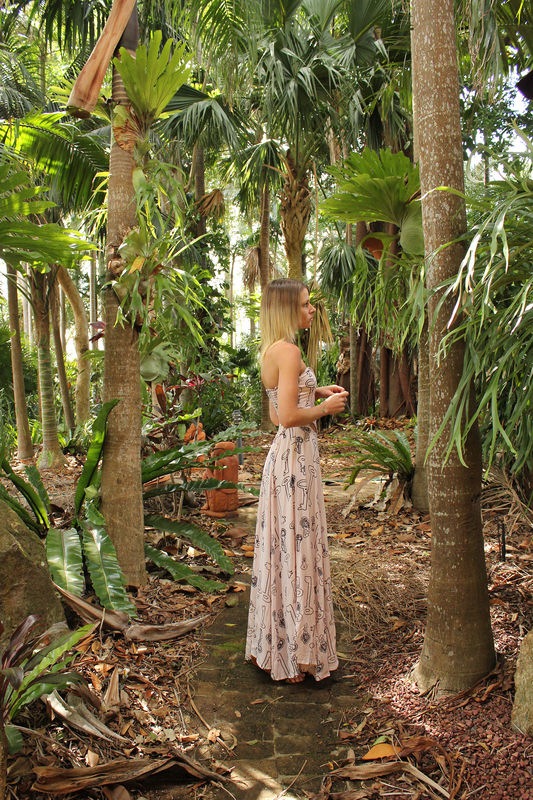 Amazing pictures, love this maxi dress! Such a lovely dress! The print is so cute. gorgeous dress! love this pattern. Dear, this dress is so cute! Love it! You, your hair, the scenic locale in Bali where you took your outfit photos and your "The Prisoners of St Petersburg" key print dress all look beautiful. I like the look of the shirring of the back of the bodice of the dress. That dress is incredibly beautiful!! You look gorgeous and beautiful scenery. I would love to go to Bali one day! I am in love with this dress, it looks great on you! There's nothing else to say or do but to just adore your dress. It fits you perfectly and it definitely compliments your beauty! If there's any way I could buy this dress, I will 100% purchase one for myself. So adorable! I love your outfit. It looks very comfy on you. I LOVE YOUR HAIR BY THE WAY TOO! I've always wanted to color my hair red but I guess, it will not suit me. The dress looks great on you.